Are you afraid to mix it up? I can help! I can not believe it is almost October! The summer has flown by and I am gearing up for a busy fall season. I have had a ton of feedback from all of my scarf loving followers and I love to hear from you. If you have purchased a scarf that you are enjoying or have gifted one to a friend, it is always appreciated if you post a review on Facebook. It helps me and it helps others who are deciding which scarf is the perfect one for them. After receiving some requests for in person shows, I am doing some POP UPS around the country. I am in Ottawa so have bookings here, but I am also traveling to Trenton, ON, Horseshoe Valley, ON, and Surrey B.C. this fall. If any of you wish to attend please email me and I will give you the location details. If you would like to host a POP UP and are within a days drive of Ottawa please let me know, I always love to show off my beautiful scarves. I am also thrilled to be a sponsor at Lisa Larter’s Money, Mindset and Marketing event in Ottawa on November 1st. I can’t wait to meet all the enthusiastic women entrepreneurs at this event. In addition to prepping for the Christmas season and the POP UPs, I am always planning my next adventure. I am heading back to Chiang Mai to visit my favourite shop this winter and going to Bali for the first time. I expect to find some Balinese scarves to bring home for you! Stay tuned for updates! 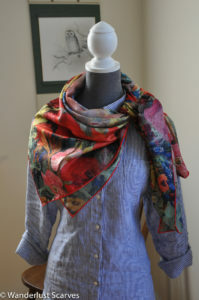 Notice here how there is a large floral pattern and lots of blue in the scarf to compliment the stripe in the blouse. Also this works well because the textures are different and add interest because of that contrast. The blouse is rougher linen and the scarf is silk. In this case the blouse pattern is busy and has black, grey, cream and white colour theme. 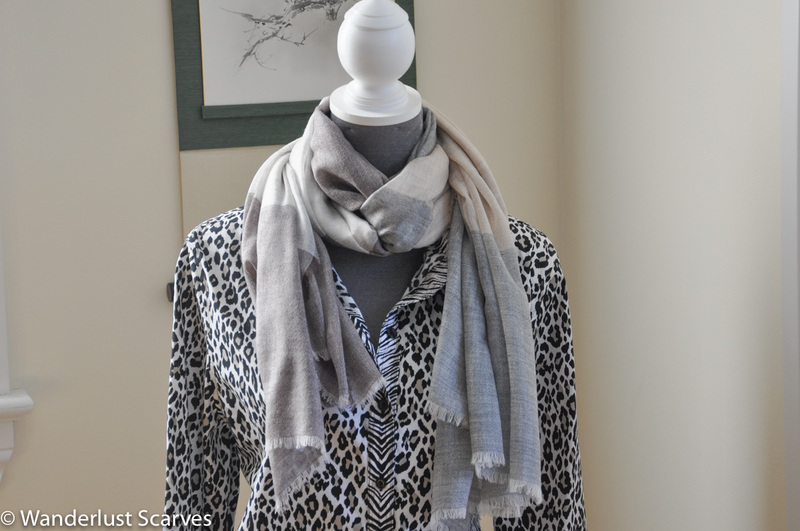 The blouse is a smooth cotton and the scarf is a very wide stripe in a super fine wool and cashmere blend. It works because the grey and cream and beige in the scarf compliments the blouse colours. I hope this gets you thinking about how you can mix up your scarf selection. Do you like how this beautiful cream and grey scarf looks tied like this? Follow me on Facebook and I will go live next week to show you how to tie it! I love your suggestion to mix patterns – especially the striped shirt with that beautiful floral scarf! Thanks for the tip! Thanks! I so glad you like it. If you love scarves you will want to be part of my club! Each month you will be sent an email coupon for a discount on the featured scarf of the month. SIGN UP NOW! Exclusively for members only.